Thanks to feedback from a NovelRank user, RSS feeds for individual books has been improved, especially for Firefox users! 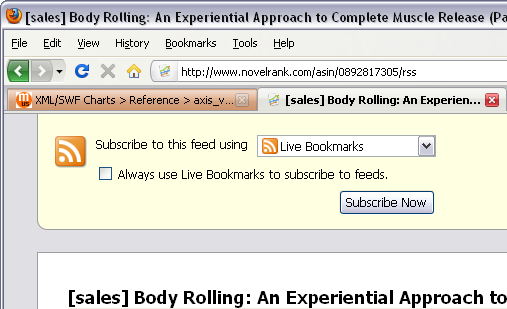 Now, when you go to a book’s details page such as the book Body Rolling, you will now notice that in the toolbar at the top is the famous RSS subscribe icon letting you know that there are RSS feeds available on this page! These are the same RSS Feeds that are available under the RSS feeds tab, including Amazon book sales. Furthermore, if you go directly to one of these feeds, Firefox will automatically understand that this is an RSS feed and offer to add it as a Live Bookmark for you! So now it is even easier to get your Amazon book sales or sales rank feeds in RSS form. Thanks to Stephanie Golden for bringing this to my attention! This entry was posted in News, Tips and Tricks and tagged firefox, rss on June 30, 2010 by Mario Lurig.